Methadone dispenser MD-LK 03 is designed for methadone solution dosing in a setting of an ambulatory medical facility meant for the administering of the substitution therapy. 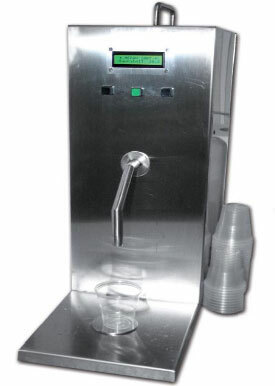 The device is fully automatic, equipped with dosing pump and operation software. The dispenser is intended for substitution therapy facility with capacity of up to 300 clients per day. The device is supplied for running of the dispenser, which includes complete software support for running of the outpatient substitution therapy facility. The software includes client database with possibility of identification by photo, evidence of all given doses and of total dosage amount given out. Software also generates statements for health insurance companies. Compared to the previous model, it is possible to adjust the dose manually in case of software failure. The design of the device allows safe and hygienic opiate handling. The device is easily portable. The device is meant for pumping of volume does of fluids ranging from 3 - 99,9 ml. Due to the use of the silicone tube in pumping segment, it is possible to measure out only such fluids, which are compatible with this material (it is not possible to measure out acids)! For the application in health service the single-use infusion set GAMA IS 122 must be used as a pumping segment. The dose can be adjusted either manually through the panel of the device, or, in case of using the operation software, from PC through USB port.